In my Operation Make It Tidy (OMIT) quest, I will share articles and ideas that have given me insight into how to keep the kitchen neat and tidy as I go. To do that, I have to discuss how I came to this point. To those who knew me up to 10 years ago, this would have been a laughable quest. But I have come so far, and the person I can think most for that is Marie Kondo. Here’s how I became a believer and a doer. One of my great resources that inspires me as a school superintendent is my membership in Consortium 2031, a group of seven school districts all aspiring to be the best they can be. In our spring 2018 meeting in Edina, MN, I was learning at a session on 21st century classrooms. The presenter mentioned a book, The Third Teacher, which focuses on how classroom design can play a major part in helping students learn. The main premise: classrooms should not contain just a lot of really cool stuff and they should not be a ‘shrine’ to the teacher’s interest or passions. Everything in the classroom should be well placed to assist/motivate/inspire/instruct students. There should be nothing extraneous. 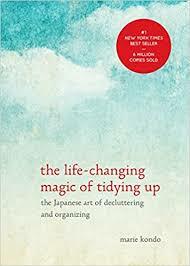 The presenter mentioned that a major inspiration behind that was Marie Kondo’s famous book, The Life-Changing Magic of Tidying Up. Famous? I had never heard of it! I bought it and read it that night. (Thank you Amazon Kindle! I have paid you dearly, but I do love reading books when I want to read them). “We should be choosing what we want to keep.” The rest is what you need to get rid of. “Take each item in one’s hand and ask: ‘Does this spark joy?’ If it does, keep it. If not, dispose of it. Learning how to fold clothes. Check out Marie’s video on folding clothes. You’ll see – she LOVES this stuff. She talks to her clothes, and to all the things she loves. I use this same technique for dish towels. “Clutter has only two possible causes: too much effort is required to put things away or it is unclear where things belong. Yeah . . . I’ll add a third . . . too lazy or uninterested to keep things decluttered, and, in too much of a hurry to get to the next task. And in our kitchen, everything now has a place. There are no clutter drawers. I can see every spatula/peeler/spoon/pan without having to move something that is on top of it. I found complete sets of measuring spoons and cups, and I gave away many measuring spoon and cup orphans. I bought just a few organizers – like these drawer separators from Amazon, which I love. It’s beautiful! Jill is completely on board. It started off as her watching me de-clutter my closet, wondering who had taken over her husband’s body. And now, she’s completely on board. We are on a first name basis with the good people at the Goodwill stores. I have given the book to members of my family – I don’t know if I have any converts yet. Bur it remains the key to my OMIT quest, and I am grateful to Marie Kondo for setting me on this path.